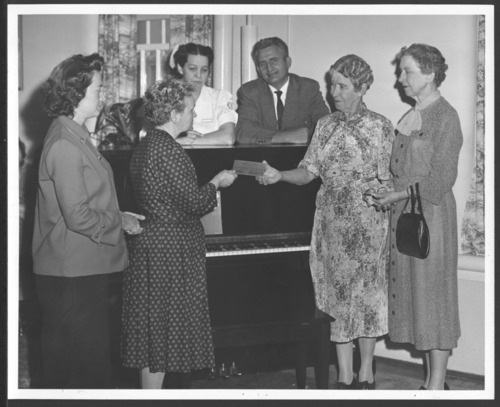 A photograph of a piano being presented to the Osawatomie State Hospital by the grandchildren of Rev. Samuel Lyle Adair, the first chaplin of the hospital. Rev. Adair served the hospital patients from the time it opened in 1865 until his death in December 1898. People in the photograph (l to r) are Dr. E. Andri, staff psychiatrist; president of the patient government organization of the Adair Building; Mrs. Ruth Clark, nursing superintendent; Dr. George Zubowicz, superintendent of the hospital; Ada M. Remington, presenting the plaque, and Jessie Remington Willis. Names of the other grandchildren are listed on the back of the photograph.